The United States Congress designated the Guadalupe Mountains Wilderness (map) in 1978 and it now has a total of 46,850 acres. All of this wilderness is located in Texas and is managed by the National Park Service. Approximately 260 million years ago, a 350-mile reef formed along the edge of the great sea that covered this area. With time, the sea receded and the reef died, only to be buried by sediment. Eons later an uplift created the arid Guadalupe Mountains and erosion wore down the sediment, eventually revealing what is now the most extensive exposed fossil reef on the earth. The most outstanding stretch of exposed reef is within Guadalupe Mountains National Park, 55 miles southwest of Carlsbad, New Mexico. More than half of the park is Wilderness, the largest and oldest in the state and the only one in western Texas. Rugged mountainous terrain here reaches 8,749 feet on Guadalupe Peak, the highest point in Texas. More than 80 miles of trail, some in the Wilderness, give access to the mountains. You can hike the Guadalupe Peak Trail to the "Top of Texas" (a strenuous 8.4-mile round-trip), where on a clear day the view will be magnificent. Whatever the time of year, you'll want sturdy boots for rough hiking all over the Guadalupes, plus a tent, rain gear, and a strong back to haul water as you'll find no sure water in the area. Flora and fauna don't seem to mind the water shortage. Resident species tally up at more than 900 plants (watch out for those with needle-tipped spines), 60 mammals, 310 birds, and 55 reptiles (some poisonous) and amphibians. 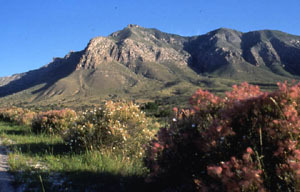 The Guadalupe Mountains Wilderness protects habitat for spotted owls, peregrine falcons, black bears, mountain lions, and endemic species such as the Guadalupe Mountains violet. Here, one can find outstanding opportunities for solitude, with many of the trails and campsites receiving less visitation in one year than popular trails in busy parks receive in one day. Planning to Visit the Guadalupe Mountains Wilderness? How to follow the seven standard Leave No Trace principles differs in different parts of the country (desert vs. Rocky Mountains). Click on any of the principles listed below to learn more about how they apply in the Guadalupe Mountains Wilderness.